The following four letters were purchased for $1 each at a Pasadena, Ca. postcard show in 1996. They were scattered about in a plastic bin containing hundreds of other old envelopes, many without any letter inside. 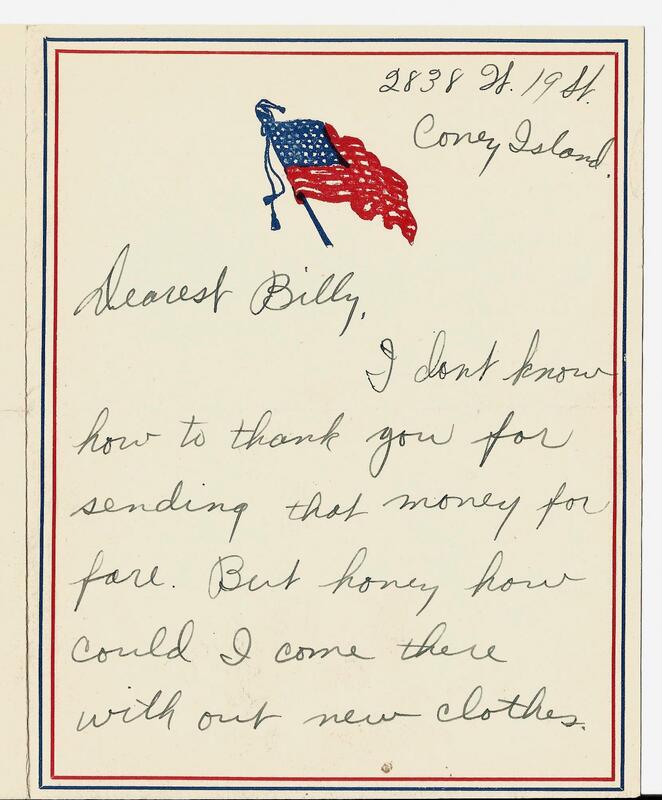 All the letters below were mailed from Millie Montana of Brooklyn, N.Y. to Mr. Wm. Woodside at 207 S. Doxtater Ave. in Rome, N.Y. Millie wrote other letters to William during this period, as revealed by empty envelopes. However the four I did find tell a story. 1. 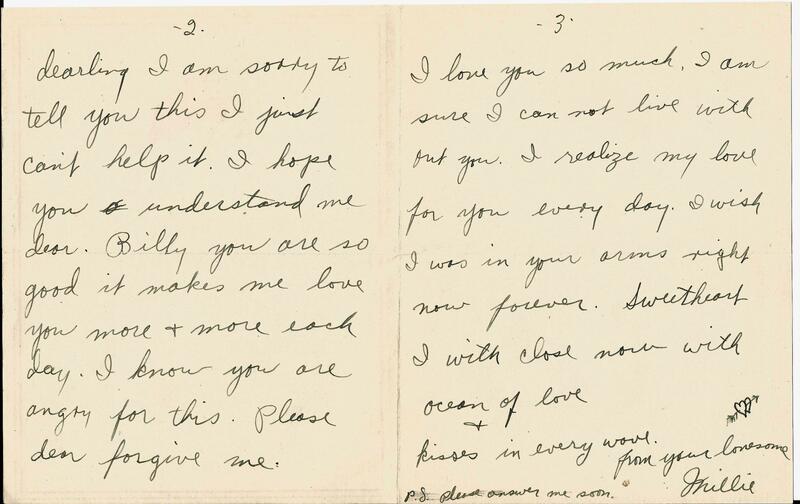 Letter postmarked Jan. 11, 1930 in Brooklyn, N.Y.
You don't know how glad I was to receive your letter. Dearest Billy I have no picture of myself now. Unless you want one of my small snapshots. I will send it to you in the next letter. Billy, I feel so lonesome I wish you would come and see me. I remember the ring I gave you, I didn't know you still had it. Dear sweetheart it is so warm out here just like summer, some people go bathing yet. I am spending a few weeks in Coney Island with my other sister. I have not heard of my husband. I haven't done anything about my separation. Dear, I am glad that you still love me. Darling do you really want me? I hope that you mean every thing you write. Let me know when you are coming to see me. Dear, What does your parents say about you writing to me? Do they care. Do they know you are writing to me? Billy I miss you so much. And I L--E you. I will close my letter with love & kisses. P.S. Please Bill answer me as soon as you can. Excuse my pencil writing. 2. Letter postmarked July 25, 1930 in Brooklyn, N.Y. I was glad to hear from you. Yes dear, I will come there if you send me money. I am glad everything is all right out there. I hope it keeps up that way. The weather is very hot out here I can't stand it. I will close now with love. 3. Letter postmarked Aug. 1, 1930 in Brooklyn, N.Y. I haven't heard from you for a long time. I suppose you are too busy to write. I am now living in N.Y. with my sister. If you are not busy you'll write to me, won't you? I will be waiting for your answer. I haven't much to write so I close my letter hoping you'll answer soon. P.S. Don't forget the address.